Email may be the oldest form of digital communication, but it’s among the most reliable and profitable. As you’ll see in the course of this post, it’s the one medium your business can retain complete control of your core message. Social media, for example, is an excellent tool for brand awareness and reaching out to a broad audience. Yet, it does not have quite the same power as a personal email landing straight into your inbox. To fully appreciate the potential returns of email marketing, is to understand how it has evolved over the past decade. 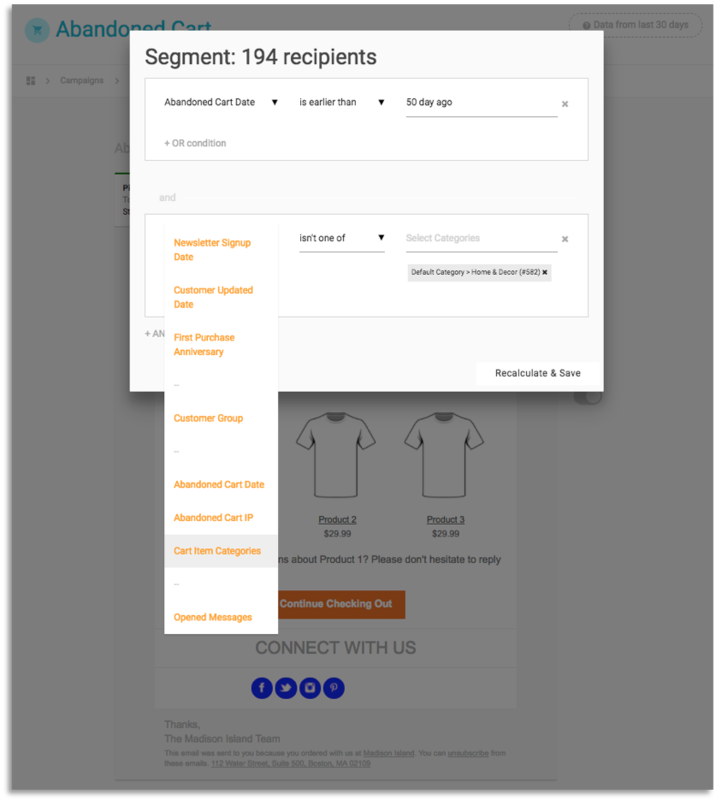 You now have the ability to send personalized emails to individuals as well as specific groups. Automated campaigns have improved to the point of responding to a subscriber action within seconds. Increased use of mobile devices has further altered the way email design works – from the subject line to the layout. Email marketing done right can help your business form relationships with customers. As a recent Adobe survey suggests, email is still the preferred communication tool across all demographics. The emergence of Slack, Messenger, and WhatsApp has done little to dent email’s prowess. This is one of several areas where email marketing comes up trumps. You can segment your subscribers and deliver the content that matter to them. After all, segmented emails see a 100% higher click-through rate (CTR) than unsegmented versions. The fact you could choose between coffee or tea drinkers shows how flexible you can be. The point is to segment your subscribers to suit the purpose of your email campaigns and business. 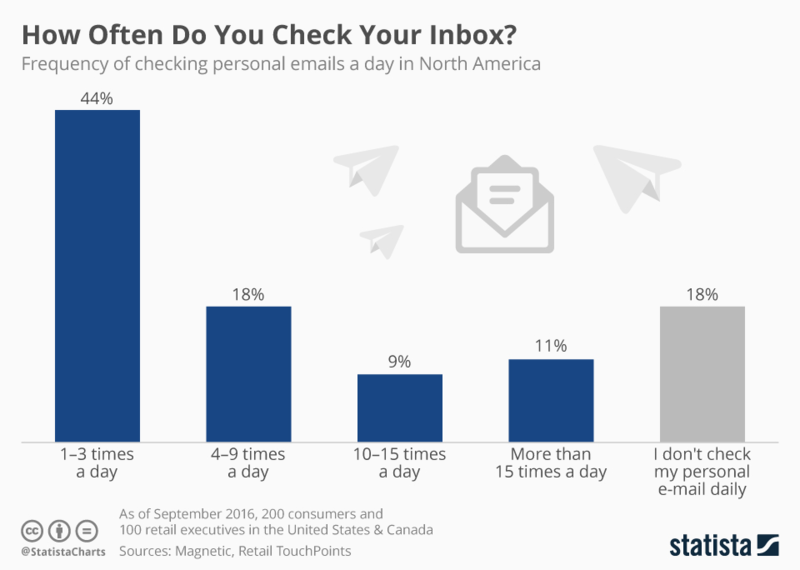 As the chart above shows, 82% of Americans and Canadians check their inbox at least once a day. As a result, the subject line of your emails will be seen by the vast majority of subscribers. One of the pitfalls of email marketing is ending up in the spam folder. This has ramifications beyond your subscribers as it affects your deliverability and sender reputation. Once its damaged, it’s a long, hard road to recovery. Build and maintain a healthy email list: Your work doesn’t stop once subscribers join your list. You should monitor open rates and click-throughs, identifying those who are engaged with your business. For those who do not open your emails, try to re-engage with them. If that fails, it’s time to let them go. And whatever you do, never use a purchased list. Follow our guide on email list cleaning to find out more. Avoid “spammy” language: Some spam filters look at your text and filter out emails using words like “free,” “100%,” or “guaranteed.” This counts both in the subject line and the body of your emails. Be clear on who the email is from: This is also good practice. If you want the spam filter to trust your emails, let it know who the email is from. Always include an unsubscribe link: Giving your subscribers the option to unsubscribe from the content they don’t want to read will keep your email list healthy and open-rates high. It’s also the law. Follow the CAN-SPAM Act: As we just mentioned, there are laws in place which are designed to prevent spam. The CAN-SPAM Act covers the United States, and GDPR has just come into force across the EU. It’s worth looking into the various legislation around the world. In essence, you need to be a responsible email sender, following good practice, and delivering the content subscribers have signed up to. Email marketing is the one place where you retain complete control of your core message and brand. You can use it to build relationships with your subscribers and gain their trust. The key is to send engaging, relevant, and useful content. Give your subscribers a reason to keep opening and reading your emails. Send newsletters: Make it daily, weekly, or monthly – whichever is the norm for your industry, and crucially, set a frequency that your business can manage. An interesting monthly newsletter would be far more beneficial than a mundane daily one. Avoid overselling: As a business, it’s in your interest to sell as many products or services as you can. However, resist the urge to use email marketing solely as a promotion channel. Follow the 80/20 “information-promotion” principle. Take the opportunity to show why your subscribers should do business with you. Respond to individual emails: This is an essential aspect of building trust. You may use a no-reply address to send marketing emails but ensure your subscribers can contact your business. Replying to these emails will add a personal touch, and push you ahead of your competitors. The key is to treat your subscribers with respect. They already know about what you sell so give them reasons to purchase with you. Share your thoughts on the latest industry news, insider knowledge, and project your personality. One of the appeals of emails is they can easily be shared beyond your list of subscribers. At the click of a forward button, a recipient can send your latest deals or news to other people. This is particularly powerful because all the evidence shows we trust recommendations from peers more than any other source. The bottom line here is to create high-quality, engaging, and exciting content people want to share. However, there are several things you can do to make it easier for subscribers to broadcast your emails on your behalf. Utilize referral marketing: You could extend a special promo code or offer to the recipient’s social network. You could also follow a strategy used by the likes of Booking.com, where you and your friend/relative can get money off the next purchase in the event of a successful referral. Direct your subscribers to share: As we’ve said before, not every email needs to be about selling your products. Instead, you can replace your call-to-action (CTA) with a “Forward to a Friend” – once again tapping into the power of referral marketing. Simple design: The layout and white background mean the focus is entirely on the content. Eye-catching image: Lonely Planet knows one of its core strengths is breathtaking images, which it uses to full effect. Social media icons: This is an email which is eminently shareable. An impressive image, a trusted brand, and interesting content for hikers. The icons at the top-right of the email make it possible to share at a click of a button. 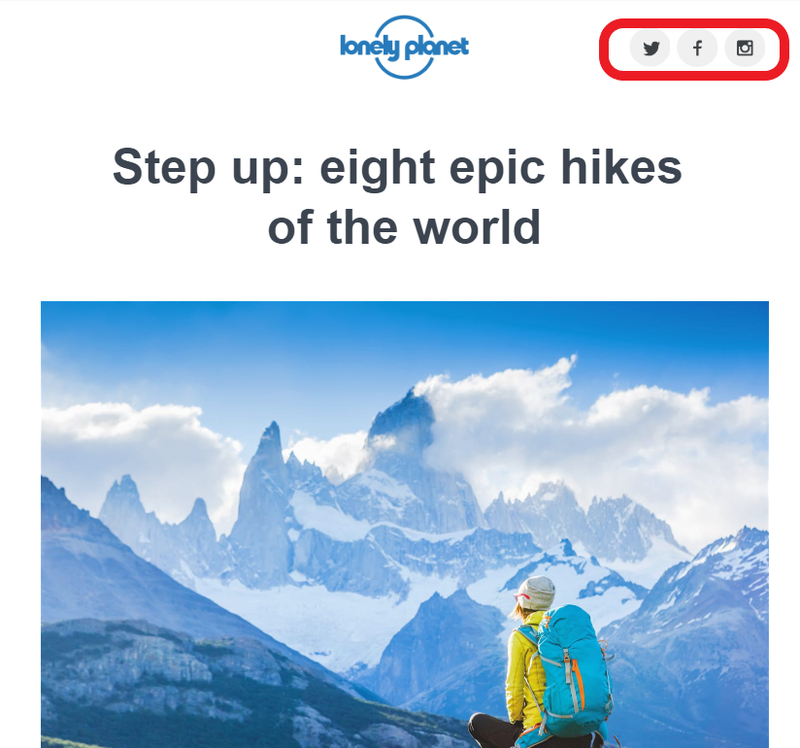 As you can see with Lonely Planet, it’s important to create emails people want to share in the first place. Once you’ve done that part, you can then focus your efforts on making it as easy as possible to share. As with everything in email marketing, you need to take a holistic view. When emails exploded in popularity towards the end of the 20th century, only desktops and laptops could handle them. Fast forward twenty years, emails are accessible across multiple devices including tablets and mobile phones. You can even read and reply to emails using smartwatches. Ensure your email layout is mobile responsive: With 54% of emails being opened for the first time on mobile devices, it’s essential to follow mobile-friendly design. We recently published a post detailing on how you can do this. Keep your subject lines short: On desktop computers, subject lines can be up to 50 characters long before they get cut off. For mobile devices, it’s reduced to just 20 characters. It’s not always possible to keep your subject lines this short, so ensure the most important information comes first. Focus your content: Ever written an email on a mobile phone and being surprised to see how short it is on a desktop when you read it later? In today’s superfast digital age, paragraphs and even sentences can appear longer on mobile devices. So keep your content concise and focused. Use image-led design to keep the attention of your subscribers. 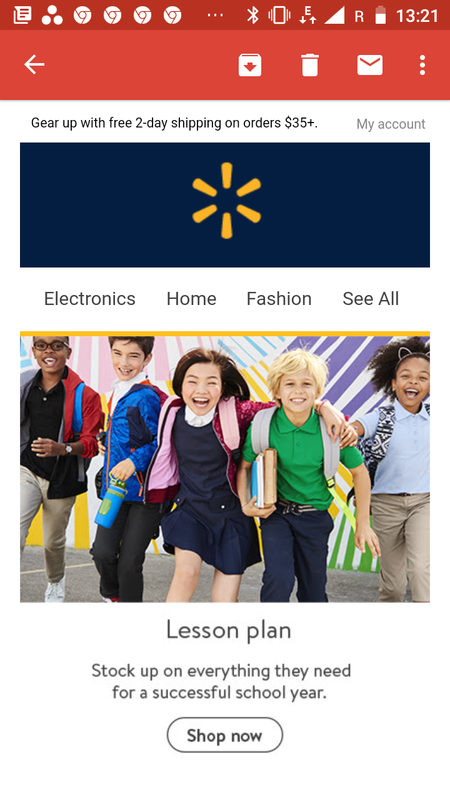 As you can see from this mobile email from Walmart, it follows the principles of using images with concise content. The result is a single-column layout that works across multiple devices. The trick is to focus on simple designs which deliver your key message. As with any marketing strategy, it’s important to be able to measure performance. You can use email marketing platforms like MageMail to analyze key metrics and find areas for improvements. Depending on the purpose of your email campaigns, key metrics will differ. For example, if you’re looking to promote a blog post, then you’ll be looking for a high click-through rate (CTR). Whereas, if you’re selling a particular product, you’ll be focusing on conversions. Identify the right metrics for your emails: As explained above, the first step is to use the right metrics for the purpose of your email. A high open-rate means nothing if your subscribers are not taking the intended action. Segment your subscribers: You can use metrics to measure the engagement levels of your subscribers. Using the data, you can then split them into groups depending on the number or type of emails they open. Being proactive with metrics will enable you to make the most of email marketing. To get a complete understanding of how key performance indicators can make all the difference, check out this post. A recent report from Marketing Week suggests email directly generates £29 billion ($37.6 billion) in annual sales in the UK alone. And it’s cost-effective too, with data showing email’s return on investment (ROI) measuring $44 for every $1 spent. Add urgency to your emails: This works in small doses, and should only be deployed when the urgency is real. For example, a 24-hour special offer or limited stock. If you take this approach too often, it will start to lose its effect on subscribers. Color matters: It’s long been known that color can affect moods and for emails, it’s no different. Blue generates trust and dependency, while red indicates excitement and passion. There should also be an emphasis on the color of your brand, which can increase recognition by 80%. Plus, contrasting colors will ensure your CTA stands out from the rest of your content – thereby driving up conversions. The brand is built around social proof, relying on contributions from millions of people around the world. 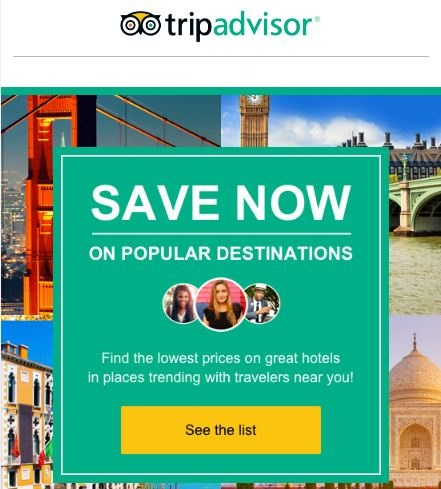 As a result, TripAdvisor’s emails follow a similar theme with lists of destinations, hotels, and restaurants sorted by reviewer ratings. Once again, it’s critical to focus on the content rather than just chasing the cash. Create emails your subscribers have signed up to, and the revenue will follow. You can use emails to maintain your presence in the mind of your subscribers. With countless businesses vying for the attention of customers, you need to be proactive in reminding your audience you exist. By doing so, it’ll provide your business with an edge when it comes to the moment of purchase. Marketing emails are a highly effective way of doing this. The key thing here is to send enough emails without overloading or annoying your subscribers. Making potential customers feel comfortable and familiar with your brand will lead to more purchases. It’s a showcase of how a business can maintain not just consistency of the brand but also drive home the same message across multiple platforms. The persistence means it will not leave the mind of subscribers easily. 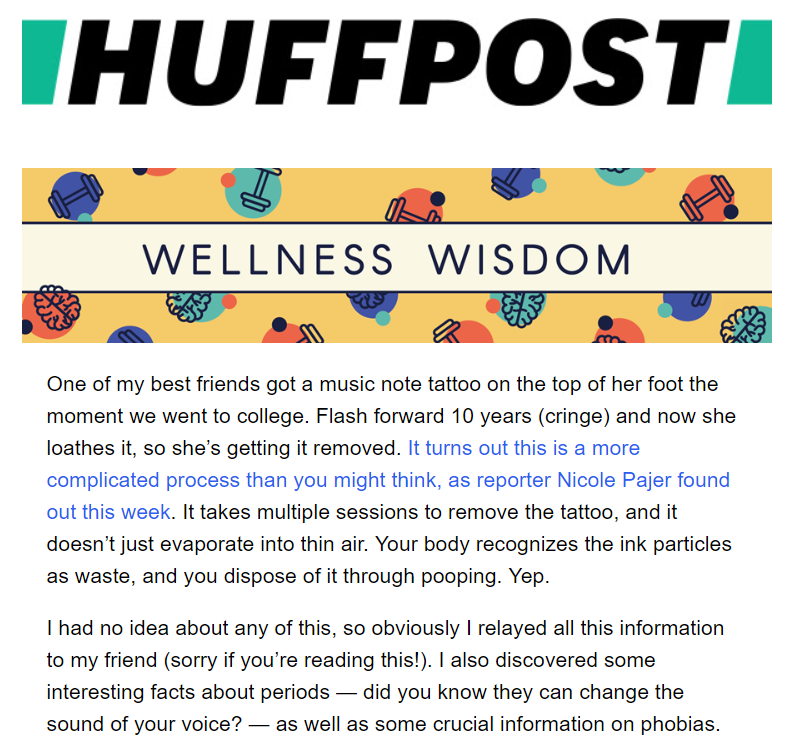 HuffPost offers a variety of email packages for would-be subscribers. Under each option, it indicates how often these emails would be sent out. Taking this transparent and personal approach is pivotal to getting the brand-customer relationship off the right foot. Once again, a stellar example from HuffPost. You’ll note there’s no mention of a subscriber’s name and no hint of personalization. However, the tone is friendly, conversational, and personal. The writer is sharing a personal experience and making it relatable to the reader. This type of content sticks in the mind of subscribers far longer than a standard corporate email. The challenge is to separate your brand from your competitors. With smart use of marketing emails, you’ll be able to highlight those differences and win over the hearts and minds of subscribers. To take your email marketing strategy to the next level, you should look at automation. At MageMail, it’s what we do. We’ve seen clients dramatically scale up their revenues within weeks of working with us. In essence, automated email marketing can respond to individual actions and deliver highly personalized content straight into inboxes. Statistics prove automated emails enjoy some of the highest engagement rates. Abandoned cart emails, for example, see an average 40% CTR. When you consider over $4 trillion is left behind each year, with $2.5 trillion being recoverable – it’s a huge opportunity. MageMail offers the full range of automated emails for Magento store owners. From cart recovery to welcome emails, each one is designed to save your resources and maximize revenues. Be proactive: The first thing is to get going. Setting up automated emails isn’t rocket science, and if you’re doing it with MageMail, we’ll be with you every step of the way. Select the right emails for your business: You should take the time to analyze your business and identify where you can help your clients. For example, if you have a grocery store you’ll want to use our replenishment reminders for regular purchases. Follow up with a series: If your subscribers failed to engage with the first email, whether it’s cart recovery or a welcome email – keep trying. There could be a host of reasons why they missed the first one. It could be they were simply distracted and need a reminder, or just a little more persuasion. Once in place, there’s no doubt automated emails will save you time and maximize your revenue. By integrating with your site and setting it up to directly respond to actions of individual customers, it can make your email marketing evermore personal. Email marketing is what you make it to be. With other forms of digital marketing and social media, there’s always the danger your message could be distorted by factors outside of your control. The beauty of email is the intimate level of communication between your business and each subscriber. Free of external influences. The running theme throughout this post is to ensure your content is engaging for your subscribers. As a business, you need to be confident to project your own voice and brand. Focus on a single message: With each email, you need to focus on a singular message. Ensure it matches with the overall objective of your campaign. For example, if you’re looking to sell a product – then the message should be about the product and its benefits. For a more general news update, the content needs to contain a story and limited product promotion. Consider your brand: Though you should be confident about having fun with your emails, it’s essential to remain consistent with your brand. If your audience tends to be middle-aged professionals, then create the content accordingly. Be creative but also stay in touch with your subscribers. Attain (and maintain) high standards: Whatever your brand, whether it’s young and funky or professional and serious, your emails should be blemish-free. No typos, spelling errors, or technical glitches. Always proofread and test your emails before you hit the send button. The key is to treat your emails for what they are — your message, to your audience. Subscribers are some of the hottest leads you could get, so take the opportunity to show your best face and convert them. We’ve put together this list of ten benefits of email marketing and showed you how to make the most of them. In a nutshell, it’s about creating content your subscribers have signed up to. Too many businesses still see emails as a selling tool rather than a relationship building asset. The latter option is not only more appealing to subscribers but generates more revenue in the long-term. People quickly switch off at the sight of “spammy” style emails and senders may find themselves in the spam folder rather than the inbox. Treat your subscribers with respect they demand, and you’ll reap the rewards of email marketing. There’s no digital marketing strategy out there that is more cost-effective. Be engaging, be relevant, and be useful. The benefits are there to be taken.